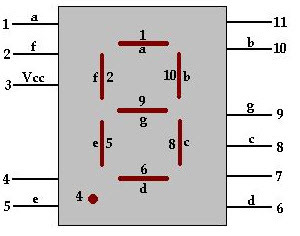 A Seven segment display is the most basic electronic display. It consists of eight LED’s which are associated in a sequence manner so as to display digits from 0 to 9 when proper combinations of LED’s are switched on. 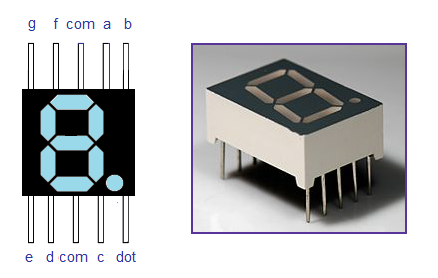 A 7-segment display uses seven LED’s to display digits from 0 to 9 and the 8th LED is used for dot. A typical seven segment looks likes as shown in figure below. The 7-segment displays are used in a number of systems to display the numeric information. They can display one digit at a time. Thus the number of segments used depends on the number of digits to display. Here the digits 0 to 9 are displayed continuously at a predefined time delay. 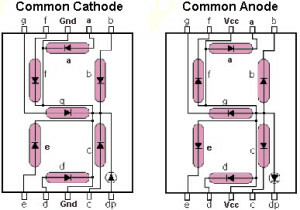 The 7-segment displays are available in two configurations which are common anode (V+) and common cathode (GND). Here common anode configuration is used because output current of the micro-controller is not sufficient enough to drive the LED’s. The 7-segment display works on negative logic, we have to provide logic 0 to the corresponding pin to make on LED glow. This tutorial you can learn 8051 interface 7 segment display with 8051 controller. I chooses AT89S51 micro controller(You can select any other keil support micro controller) and demonstrated, this is very simple and follow this below.